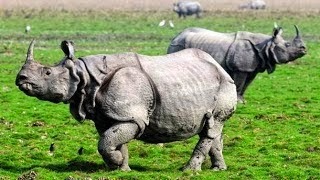 Welcome to Kaziranga National Park!It is the home of one-horned rhinoceros. The best time to visit Kaziranga National Park is during November to mid-April. Generally the authority concern opens the Park for the visitors on 1st November every year. During the monsoon, the mighty Brahmaputra River bursts its banks spreading flood water in the low-lying grasslands and it causes animals to migrate one area to another area within the Park. Climate: Sub-Tropical Monsoon with average rainfall of 1320 mm and temperature ranging from 80C in winter to 380C in summer. Accessibility: Kaziranga is well accessible vide Air, Rail and Road. LGB International Airport, Guwahati (also known as Guwahati International Airport and formerly as Borjhar Airport) is the primary international airport of the North-Eastern States of India. It is situated at Borjhar in Guwahati, Assam. This airport is named after Lokpriya Gopinath Bordoloi, who was a freedom fighter and also the first Chief Minister (earlier called as Prime Minister) of Assam after independence of India. Regular flights from major cities of like New Delhi, Mumbai, Kolkata, and Guwahati are available to this airport. This airport has international connectivity from Bangkok. Jorhat Airport (also known as Rowriah Airport) at a distance of approx. 98 km is the nearest airhead to Kaziranga National Park. Regular flights from major Indian cities like New Delhi, Mumbai, Kolkata, Guwahati are available to this airport. Taxi services can be availed from the point of Guwahati Airport and Jorhat Airport to reach Kaziranga. Bus/Taxi services: The 37 National Highway is attached with the Kaziranga National Park and regular Bus/Taxi services are available day/night from the major cities of Assam like from Guwahati, Nagaon, Tezpur towards Kaziranga and on other hands, the same services is available from Jorhat, Sivasagar, Dibrugarh, Tinsukia towards Kaziranga. Railway: The nearest railhead is Furkating, which is about 75 km to Kaziranga, however, the regular train services are available from Guwahati towards Mariani, Jorhat, which can be easy to arrive Kaziranga. The Kaziranga National Park in brief: Covering a measurable area of Golaghat and Nagaon districts in Assam state, Kaziranga National Park (KNP) is a World Heritage Site, which hosts almost two-thirds of the world’s Great One-horned Rhinoceroses and variety of wild lives. On the edge of the Eastern Himalaya biodiversity hotspot, Kaziranga has achieved notable success in wildlife conservation in India. Kaziranga claims to be the highest density of tigers among the protected areas in the world and it was declared as Tiger Reserve in the year 2006. Moreover, the park is a home to large populations of elephants, wild water buffalo, and swamp deer.The Birdlife International recognized Kaziranga as Important Bird Area for conservation of avifaunal species. The beautiful Kaziranga is a vast area of tall elephant grass, marshland and dense tropical moist broadleaf forests, crisscrossed by four major rivers including the mighty Brahmaputra. Also the park has several small water bodies inside. The park celebrated its centennial in 2005 after its establishment in the year 1905 as a reserve forest. The length of the park is 40 km approx. from East to West and the breadth is 13 km approx. from North to South which covers 430 sq km (170 sq mi). Elevation ranges from 40 m (131 ft) to 80 m (262 ft). The KarbiAnglong Hills give as a corridor for safe movement of animals. The northern and eastern boundaries are formed by the Brahmaputra River; southern boundary is formed by Mora Diphlu. Diphlu and Mora Dhansiri are the rivers creating the Kaziranga attractive within. The flat expanses of the park are the fertile alluvial soil formed by erosion and silt deposition by the river Brahmaputra. Further, the beautiful landscape of Kaziranga consists of exposed sandbars, beels (riverine flood-formed lakes), chapories (elevated regions) which provide retreats and shelter for animals during floods. Movement for conservation of Rhinoceros: Tracing back to 1904 when Mary Victoria Leiter Curzon, the wife of the Viceroy of India, Lord Curzon, visited the area, she failed to see a single rhinoceros although the area was renowned for rhinoceros. She persuaded her husband to urgently take measures to protect the species. Consequently, on 1st June, 1905, the Kaziranga Proposed Reserve Forest was created. Hence, the Mary Victoria Leiter Curzon, Baroness Curzon of Kedleston is credited with starting the movement for conservation of the rhinoceros of this region. 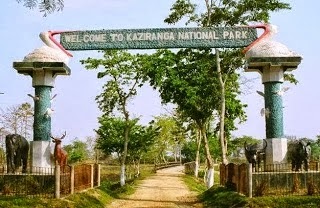 Kaziranga was designated as Reserve Forest in 1908. In the year 1916, it was converted as The Kaziranga Game Sanctuary, the same name was remained till 1938 and hunting was prohibited, but visitors were permitted to enter the park.The Kaziranga Game Sanctuary was renamed as Kaziranga Wildlife Sanctuary in the year 1950 by P.D. Stracey, the forest conservationist. The Assam (Rhinoceros) Bill was passed by the Government of Assam in the year 1954 imposing heavy penalties for rhinoceros poaching. Thus after fourteen years, in the year 1968, Government of Assam passed ‘The Assam National Park Act of 1968’, declaring Kaziranga as a designated national park. The park was given the official status by the Government of India on 11thFebruary 1974. Kaziranga was declared as a World Heritage Site by UNESCO in the year 1985 for its unique natural environment. Kaziranga and One-horned Rhinoceros, fauna and flora: Including Kaziranga National Park the world famous One-horned Rhinoceros is found in some other locations in Assam, such as, Manas National Park and Pobitora Wildlife Sanctuary. Kaziranga is also a home of a large variety of fauna, such as, Wild Asiatic Water Buffalo, Eastern Swamp Deer, Elephants, Gaur, Sambar, Indian Muntjac, Wild Boar, Hog Deer, Tigers, Leopards, Jungle Cat, Fishing Cat, Leopart Cats, Hispid Hare, Indian Gray Mongoose, Small Indian Mongooses, Large Indian Civet, Small Indian Civent, Bengal Fox, Golden Jackal, Sloth Bear, Chinese Pangolin, Indian Pangolin, Hog Badger, Chinese Ferret Badgers, Particolored flying squirrels, Assamese Macaque, Capped, Golden Langur, Hoolock Gibbon. In the water bodies within Kaziranga the rare species of Ganges Dolphin is found. Kaziranga is an important bird area with variety of migratory birds and according to sources, the park is the nest of Water Birds, Predators, Scavengers, Game Birds, Lesser White-fronted Goose, Ferruginous Duck, Baer’s Pochard duck, Lesser Adjutant, Greater Adjutant, Black-necked Stork, Asian Open bill stork migrate from Central Asia to the park during winter. Some river birds like Blyth’s Kingfisher, White-bellied Heron, Dalmatian Pelican, Spot-billed Pelican, Nordmann’s Greenshank and Black-bellied Tern, etc. can be seen in the park. Kaziranga was once said to be the home to seven species of vultures and now Indian vulture, Slender-billed vultures and Indian White-rumped vultures are seen. Further, other families of birds found in Kaziranga are Great Indian Hornbill, Wreathed Hornbill, Old World babblers, Marsh Babblers, Weaver birds, and so on. Two largest snakes in the world, such as, Reticulated Python and Rock Python and the longest venomous snake in the world, the King Cobra inhabit in the jungle of Kaziranga with other species of snakes. Kaziranga is rich with its flora also. It is dressed with beautiful grassland sand green forests. The sources states that there are mainly four kinds of vegetation exist in the park, such as, alluvial inundated grasslands, alluvial savanna woodlands, tropical moist mixed deciduous forests and tropical semi-evergreen forests. The variety of vegetation of Kaziranga covers with tall grasses, short grasses, open jungle, swamps, rivers and water bodies and sand. Elephant safari/Jeep safari: The best way to get inside of the Kaziranga National Park is either through Elephant safari or the Jeep safari. The authority concern of the Park and some authorized agencies provide the best deal of Elephant safari as well as Jeep safari. For exploring deep into the Kaziranga the Elephant safari can be the best option for the tourists. Sightseeing/Visit to Ethnic village of Assam: Karbi Anglong district is attached to Kaziranga National Park and tourists can talk through the Karbi villages and meet the native Karbi people and observe their way of living. Further, tourists can visit the beautiful tea gardens, coffee and rubber plantations located in the nearby locations. Accommodation/Hospitality in and around Kaziranga National Park: Some affordable beautiful resorts, cottages and hotels are available in and around of the Kaziranga National Park. GL’s Resort: Located at the foothills of Burapahar, near Kaziranga National Park in Golaghat District of Assam, GL’s Resort offers accommodation in well-furnished cottages with all modern amenities. For picnics, adventures, sports tours and students outing there are tents with attached bathroom. The restaurant serves continental, Chinese, South Indian, North Indian and Assamese delicacies. A spacious hall equipped with modern sound system and other equipments are available for parties, seminars and conferences. Tennis and badminton courts and swimming pool are the other facilities. The resort also has a children’s park. Wildgrass Resort: Located outside of Kaziranga National Park area (about 200 kms away from Guwahati), the Wildgrass Resort is built in an attractive rural style kind of architecture. The resort is surrounded with more than 40 species of trees, over 200 species of shrubs, creepers and climbers. The Wildgrass Jungle Lodge provides 18 double rooms in 2 jungle lodges. It provides tented camp accommodation pegged under a high thatched roof amidst an ambience of ruins. Bonhabi Resort: Located at Bagarijuri, 1 No. Kohara Gaon, Kaziranga, Bonhabi Resort is an ideal and wonderful retreat home away from home. It is an exotic tourist destination amidst all scenic beauty of nature. This is located at the few moments away from the main gate of Kaziranga National Park. The resort with 8 cottages is a perfect blend of traditional as well as modernity. Bonhabi is a very modern layout with magnificent views of tropical rainforest bordered with paddy fields. The majestic lobby adorned with ethnic cuisine restaurant with ethnic foods and arrangement of diverse folk culture and art forms. The Bonhabi have ample arrangement for Elephant and Jeep Safari inside the Kaziranga National Park. Aranya Resort: This resort is run by the Government of Assam. It is about 3 km from the Park entrance at Mihimukh. The lodges have A/C and non A/C rooms furnished with modern accessories and attached bathroom with running hot / cold water. Riding elephants are available at the Mihimukh entrance. On the other hand, tourists can stay comfortably at some suburban places, such as, Jorhat, Bokakhat, Nagaon, Tezpur, etc. from where Kaziranga is easily accessible. Conservation message: At present conservation of forests and protection of wildlife becomes very problematic in Kaziranga. Poaching activities, particularly of the Rhinoceroses for its horn has become the major concern for the authorities. Activities of armed poachers are growing day by day. Anti-poaching preventive measures are not working in real terms. Hence, an appeal is to be created against such dishonest activities which may help the movement to save its habitation as well as conservation of this animal.